The ultimate sensation: caressing a seal! 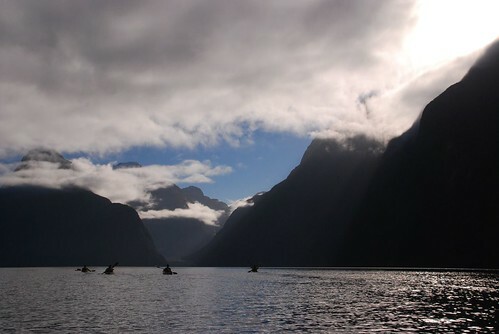 There is one place on the westcoast that almost everybody goes to see (because it is very beautiful): Milford Sound. However, most people go there on a cruise, sitting on a boat for 1.5 hours, doing the tour and driving back to Te Anau again. This wasn’t too much to our taste and thus we decided to go sea-kayaking instead. Normally the west coast of New Zealand receives about 330 rain days per year, but we were lucky enough to be in Milford Sound without rain and even better: a cloudless (or almost cloudless: just enough clouds to make for some good pictures) blue sky. Just before starting our tour we got some clothes to keep us warm and dry in case we would get wet (small moment of panic: “What do you mean “wet”? It isn’t going to rain, isn’t it? ) and a few basic instructions that would safe our life in case we would capsize (second moment of panic…). And of we went in the clear blue water. The trip wasn’t too strenuous but easy going and allowed us to enjoy the width and height of the fjord. Especially being at the bottom of it, the brain has some problem imagining how big the fjord is in reality and even though the surrounding mountains looked small, we learned that they are about 1200 meters in reality. The fact that the water under us was furthermore 900 meters deep, made it even more confusing (and caused a third moment of panic…). 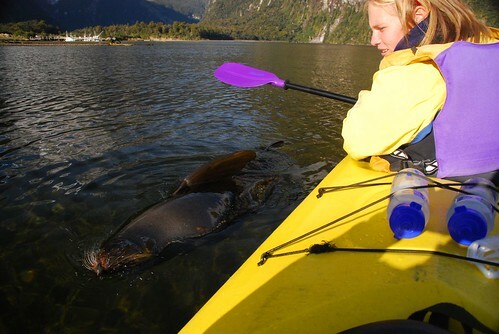 But the ultimate moment, was when a seal passed by our boat, or better: rolled by our boat (they actually do that when they are really full: they don’t really swim, but kind of “roll by” like you would roll a sausage on a BBQ to make it evenly grilled on all sides…). And it was so close and so incredibly didn’t care about us being at 20 cm distance that we could even touch and caress it before it “rolled” on. Fantastic! This entry was written by Vera and posted on May 30, 2008 at 8:05 and filed under New Zealand, World Trip. Bookmark the permalink. Follow any comments here with the RSS feed for this post. Both comments and trackbacks are currently closed. “So the world is magic”. petits (ou grands! ) veinards. les avez-vous vraiment caressés?? @Tweety: In this case, it was really true. @Marie-Annick: Bien sur! J’etais en extase pour le reste de la journee (et quelques jours apres meme…). C’etait trop mignon! Je suis certain que cela fera partie de vos souvenirs inoubliables! Quelle chance vous avez eue!